The HL series of bucket elevator is a kind of traditional lifting equipment with round chain as lifting part. 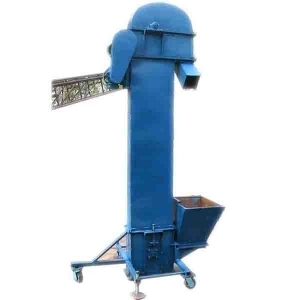 The series of bucket elevator are used to convey easy-excavating material that is powder, particle, and small block with its bulk density no more than 2.0t/m³ and low grinding property. Temperature of transited material cannot over 250℃ by the TH,TP,HL series of bucket elevator. Material temperature can’t be over 60℃ by the series of TD elevator. Temperature is allowed to 120℃ if heat-resistant adhesive tape was used. Please specify the product specification, form, material type and characteristics when placing order. The steel plate of case is thickened with good rigidity; the temperature of transiting materials can reach 250℃; the upgrade conveying capacity is 30% higher than common type; Low alloy steel loop chain is carburized and quenched processing with great intensity of tension and wear-resisting property.